A combine spits out chaff Tuesday afternoon as it harvests soybeans at a farm on SR 72 south of Highland. 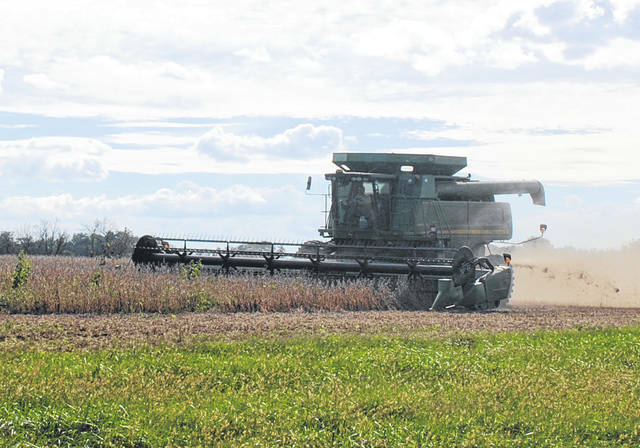 As a stretch of unusually hot October weather comes to a close, the 2018 harvest remains well underway, and farmers are already seeing good yields for some crops. Brooke Beam, the agriculture and natural resources/community development educator at the Highland County OSU Extension Office, estimated 15 to 20 percent of the total crop has been harvested, and corn and beans are looking especially good despite some damage to the bean crop in certain areas due to heat and moisture in the last month. Beam said there are a lot of variables that determine the success of any crop — some being matters of choice, others acts of God. Beam said dry weather will be favorable for farmers as the harvest progresses. According to the National Weather Service, the next chance of rain is Wednesday night with a 60 percent chance of rain during the day and an 80 percent chance in the overnight hours. Temperatures will drop Thursday into the mid-60s, and further on Saturday and Sunday, when highs will be in the mid-50s. There is a chance of showers Sunday and Monday, according to the NWS. Beam said there is still quite a bit of harvesting to do, and she foresees the work continuing into November. As the harvest continues, Beam said it’s important for motorists to be patient with large machinery in the roadways to prevent accidents. Beam said motorists should keep an eye out for reflective slow-moving vehicle signs and flashing amber lights that are affixed to large pieces of machinery. “If possible, if a car or truck can slow down and pull over, that’s also greatly helpful for a farmer if they’re driving a combine down the road,” she said.